Model the true changing nature of gas or liquid pipeline systems, and changes in available line pack over time. Design pipelines and facilities to handle peak hour demand and the variation of demand that occurs over a 24 hour period. Daily operational planning, perform operational studies to evaluate different operations over time. Optimize and manage line pack build up and depletion over time to deal with intermittent large industrial customer deliveries or peaking power plants. Model changes in supplies or deliveries due to changing weather conditions or time of day fluctuations. All of the interface features described in the Steady State section are available in the Transient Predictive simulation including the synchronized Map, Record Editor, and Reports, but with some variations in functionality. These core component will display information on the current simulation time snapshot being viewed. In addition, two more core components are available for time based data entry and reporting: A Schedule Editor can be used to create more elaborate schedules (set point changes over time), and a Trends component displays time changing values in both graphical and grid formats. The Schedule Editor is used to create groups of time based set point changes, and each group of schedules can be enabled or disabled for a quick and easy way to select what groups of changes should be applied to the simulation. Step Schedules approximate how a pipeline is actually operated, where a user might simply change the operating set point, and it is expected that pipeline model will try to achieve that set point as quickly as possible within the bounds of what is hydraulically possible, and within the operating limits of the facilities installed on the pipeline. For example, a user might reset the discharge pressure set point of a compressor station, but the horsepower limitations and other limits such as max rpm, as well as current pressures and line packs within the system will limit just quickly that set point can be reached. The NextGen transient model will closely mimic how the actual pipeline reacts to such set point changes. Ramp schedules represent gradually changing values such as ground temperatures, ambient temperatures, or loads on the system. Events are local groupings of multiple changes that occur in a preset sequence, but the preset sequence is always the same. For example, one event might be the startup of a compressor station, where units are started up, a mainline valve is opened, another bypass valve is closed, and five minutes after that a recycle valve is closed, and maybe ten minutes later a nearby regulator is set to wide open. Each of these changes can be stored as a single reusable named event, so if the user wants to start the station at 9:30am, he would create a single Scheduled Event to trigger that named event to start at 9:30am, as opposed to having to create multiple schedules every time the station needed to be started up. Events are created using the Event Editor and then scheduled in the schedule editor. Profiles are used to model predictable variations in certain values for modeling and forecasting purposes. For example, all residential loads typically follow a similar pattern, where the load is lower at night, higher during the day, with spikes in the morning when people are waking up and early evening when people get home from work, cook dinner, and so on. Industrial loads follow a different pattern, and commercial businesses also a different pattern. For forecasting loads, these standard profiles can be created in the Profile Editor and then applied globally to all loads that fit within the same category within the Schedule Editor. Profiles can also be used for daily variations in ambient air temperatures, or ground temperature variation during the year. When the user makes a change to a set point value in the Record Editor in Transient, in the background NextGen will create an Interactive Schedule to store that change so that it can be repeated if simulation is re-run. 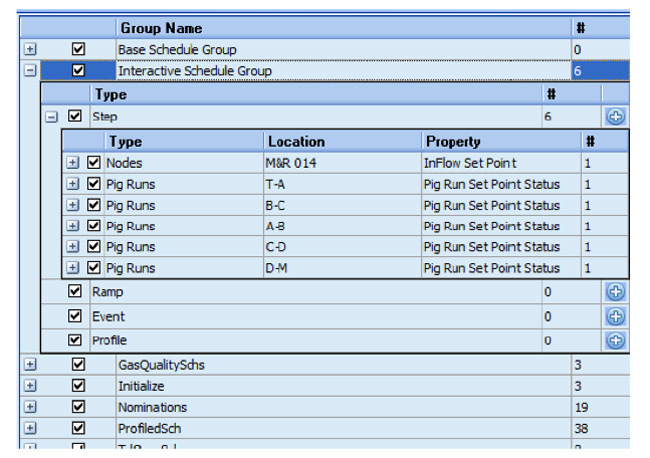 All Interactive changes are stored in their own schedule group and can be viewed at any time in the schedule editor. Thus, as the simulation is progressing, the user may interactively change several set points, close or open valves, start up a station, or shut in or modify loads at different points in time, but all of these changes are being recorded as interactive schedules that can be viewed in the Schedule Editor, and will be repeated if the simulation is re-run. The Trends component is used to view time changing variables in both graphical and grid formats over time, and both graphs and grids are customizable so users can select what data to view. View and analyze complete pipeline data over time: past, current, and future. Fill in the data gaps, determine what is occurring at locations not monitored by or missing from SCADA. Perform volume balancing to reduce unaccounted for gas or liquid. Provide a well calibrated model and accurate current operating conditions as a starting point for predictive studies performed by simulation users. Standalone Steady State, Sequential, and Transient Predictive simulations by multiple users on different machines throughout the enterprise network can be easily initialized from the Transient Online simulation so that the latest state of the pipeline is used in simulation studies. Dispatch proactively based on likely projected conditions rather than reacting in crisis mode after the fact. Better deal with over capacity conditions or short term emergency situations.